Yesterday was a very nice day here...I had friends drop by for tea and a bit of sewing talk. I also received a lovely gift in the mail. I think I mentioned back a few weeks ago; that I won a sketch from Maria of Personalized Sketches. Well it arrived; and is just lovely...now I have to get a frame and matting to fit this so I can hang it in my sewing room. Thank you Maria!!! I just love it. This is so very neat...everything you see here that is sketched. is my name. Very tiny little Marjorie all over this page...incredible work. 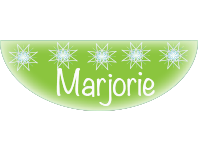 Maria is very talented; I hope you will visit her blog. These make great gifts in whatever form you would like. That is amazing and just wonderful work. Lucky you Marjorie, that is gorgeous!! What a great idea. I was amazed by the beautiful thimble picture then you said it had your name all over it. Incredible. It is a lovely piece of art to have on the wall. Thanks for stopping by Val....I am so thrilled with this. Maria is quite incredible. This is a beautiful gift, you lucky girl! The Winner of my Holiday Lane post is!!!!!!!!!! !